A team of astronomers has discovered one of the youngest and brightest free-floating, planet-like objects within relatively close proximity to the Sun. At an age of only 10 million years, which means it's practically a baby on a galactic time scale, the object identified as 2MASS J1119-1137 is between four and eight times the mass of Jupiter, and hence falls in the mass range between a large planet and a small brown dwarf star. Using data from NASA's Wide-field Infrared Survey Explorer (WISE) and other ground-based telescopes, 2MASS J1119-1137 was identified by its unique light signature using a combination of optical and infrared images from large-area surveys of the sky. "We identified 2MASS J1119-1137 by its highly unusual light signature," explains lead author Kendra Kellogg, a graduate student at Western Ontario University Department of Physics and Astronomy. "It emits much more light in the infrared part of the spectrum than it would be expected to if it had already aged and cooled." According to Carnegie's Jacqueline Faherty, the challenge with identifying such rare objects is distinguishing them from a multitude of potential interlopers. 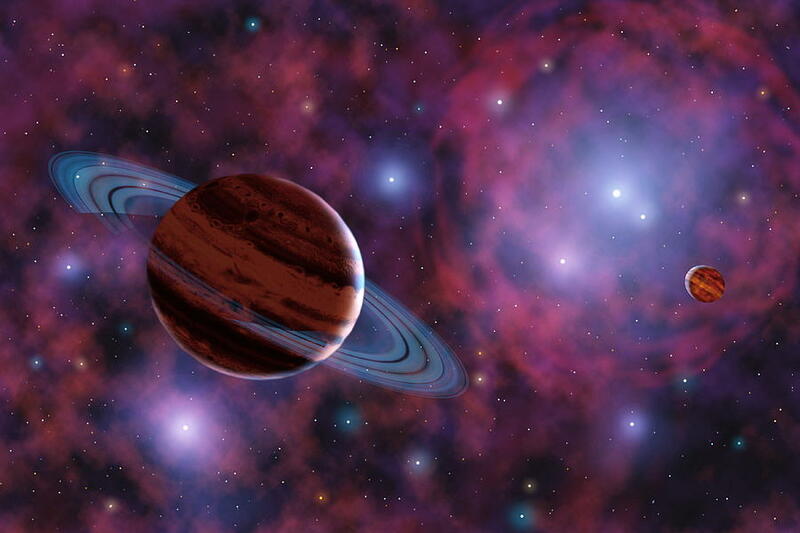 "Much more commonly, distant old and red stars residing in the far corners of our galaxy can display the same characteristics as nearby planet-like objects," says Faherty. "When the light from the distant stars passes through the large expanses of dust in our galaxy on its way to our telescopes, the light gets reddened so these stars can pose as potentially exciting nearby young planet-like objects in our data, when they actually are not that at all." With knowledge of these common misidentifications, the team immediately checked their findings using the FLAMINGOS-2 spectrograph instrument on the Gemini South telescope in Chile. "We promptly confirmed that 2MASS J1119-1137 is in fact a young low-mass object in the solar neighborhood, and not a distant reddened star," says Western's Stanimir Metchev. Next, the team wanted to determine the precise age of this object. "Our Gemini observations only showed that the object was younger than about 200 million years. If it was much younger, it could actually be a free-floating planet–an analog of our own Jupiter, yet without a host star," says Metchev. The final piece of the puzzle was contributed by Carnegie's Jonathan Gagné using one of the most efficient instruments for infrared spectroscopy in existence, the FIRE spectrograph on Carnegie's Baade 6.5-m telescope in Chile. FIRE allowed the measurement of the line-of-sight velocity of 2MASS J1119-1137 through the Doppler shift of its emitted light. Combining this measurement with the sky motion of 2MASS J1119-1137, the team discovered that it belongs to the youngest group of stars in the solar neighborhood. 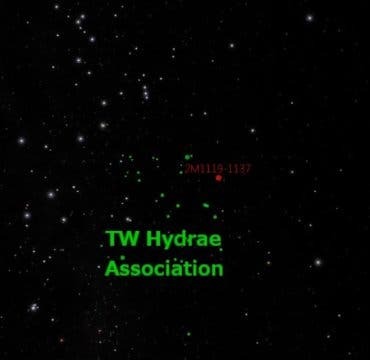 This group contains about two dozen 10 million-year-old stars, all moving together through space, and is collectively known as the TW Hydrae association, shown in the image below –a still shot from a video about these results produced and directed by David Rodriguez, using visualization software Uniview by SCISS and the American Museum of Natural History's Digital Universe data. "Demonstrating that 2MASS J1119-1137 belongs in the TW Hydrae association, and so is only 10 million years old, inevitably led to the exciting conclusion," says Gagné. Being nearby, 95 light years away, 2MASS J1119-1137 only narrowly misses the crown for being the brightest free-floating planet analog. That is held by another object known as PSO J318.5?22, discovered three years ago. However, at an age of 23 million years, PSO J318.5?22 is more than twice the age of 2MASS J1119-1137, and is therefore more massive. "Discovering free-floating planet analogs like 2MASS J1119-1137 and PSO J318.5?22 offers a great opportunity to study the nature of giant planets outside the Solar System," concludes Kellogg, who says free-floating planet candidates are "much easier to scrutinize than planets orbiting around other stars. Objects like 2MASS J1119-1137 are drifting in space all alone and our observations are not overwhelmed by the brightness of a host star next door." This work was supported by an NSERC Discovery grant at the University of Western Ontario. This work was performed in part under contract with the California Institute of Technology (Caltech)/Jet Propulsion Laboratory (JPL) funded by NASA through the Sagan Fellowship Program executed by the NASA Exoplanet Science Institute. This paper includes data gathered with the 6.5 meter Magellan Telescopes located at Carnegie's Las Campanas Observatory, Chile.